On Interstate 55 through St. Louis, Mo., ensuring safe commutes and maintaining an economic lifeline necessitated improvement of six overpasses at five locations on a heavily travelled stretch extending 1.364 miles, as well as bridge rehabilitation spanning 0.038 miles at the Lafayette Avenue overpass. While removal and overlay were sufficient for the Lafayette overpass, extensive repairs in addition to a new wearing surface were needed for the remaining five bridge decks, which required zone repairs prior to the overlay due to their box girder design. The original contract mandated use of a standard MoDOT portland-cement bridge concrete mix for the repairs and a latex-modified concrete for the overlay. 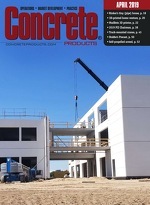 In view of traffic-flow maintenance demands and a 40- to 45-day construction time frame, however, contractor Concrete Strategies submitted CTS Cement's Rapid Set Low-P Cement for use in both patching and wearing surface overlay applications. A 4,000-psi strength achieved in less than three hours would prove more than equal to the MoDOT prerequisite of 3,000 psi to open to traffic. Moreover, the two- to three-hour wet cure would allow repairs to continue without interruption and preparations for the adjacent lane overlay to be undertaken immediately without compromising the new bond. Accordingly, local MoDOT construction engineers opted to use the product sourced from Mexico, Mo. Started in May 2009 and completed in August 2009, the six-bridge project involved removal of existing 25-year-old overlays, partial and full-depth deck repairs, joint repairs and application of a new overlay. Once patching work was completed, deck surfaces were either sand-blasted or hydro-cleaned as preparation for the overlay, measuring 11/2 to 2 inches thick, 18 to 24 feet wide, and up to 240 feet in length per placement. Two mobile volumetric mixers supplied concrete at a rate of 10 yards per 30- to 40-min. cycle. Reloading was performed within a mile of each bridge; and, recharge averaged about 30 minutes round trip, facilitated by loading of only cement, stone, sand and water for fast turnaround times. Citric acid introduced as a retarder permitted a controlled set for the finishers, plus reduced mobile mixer cleanup between loads. An 8- to 9-in. slump at discharge allowed easy placement and effective use of a Bidwell deck finisher. The mix did not segregate and adhered on sloped bridges without sagging. MoDOT conducted numerous field tests including early age compressive strengths, freeze thaw (99-100), rapid chloride permeability ( 800 coulombs), and 24-hour bond pull-off tests (>200psi). In December 2009, the I-55 South rehabilitation project was recognized by the St. Louis Concrete Council with a Quality of Concrete Award for excellence and use of new technology. Affirms CTS Cement Regional Sales Manager Ed McLean, The 572-lb. mix achieved physical performance results surpassing those of competitive traditional concrete overlay materials that require 658 pounds of cement. The cost for the new cement technology is competitive when compared with latex-modified concrete, because of the lower cement content, and offers many cost-savings advantages with its three-hour speed.